Pro-Russian separatists talk to a local resident at a check point on the outskirts of Donetsk, Sept. 6, 2014. A cease-fire between Ukrainian forces and pro-Russian separatists appeared to take hold Saturday in eastern Ukraine, raising prospects for at least a temporary halt to five months of warfare. Both sides, however, accused the other of breaking the truce in some locations. “The forces of the anti-terrorist operation support the cease-fire and are closely observing the order” of President Petro Poroshenko, Col. Andriy Lysenko, a spokesman for Ukraine's security council, told a daily briefing in Kiev. In Donetsk, the largest city controlled by the Russian-backed separatists, news reports said the night was quiet, but a top separatist leader was quoted by the RIA Novosti news agency that there had been two rounds of shelling in a town southeast of Donetsk. “At this time the cease-fire agreement is not being fully observed,'' he was quoted as saying. Also Saturday, Russia vowed to react if the European Union imposes a new round of economic sanctions against Moscow. The new sanctions were given preliminary approval Friday night and could be implemented as early as Monday. The Associated Press, citing an unnamed EU diplomat, said the new measures would target Russia's access to capital markets and trade in arms and defense technology, dual-use goods and sensitive technologies. "There will undoubtedly be a reaction from our side" if additional sanctions are taken, the Russian Foreign Ministry said in a statement, without specifying what the reaction might be. The EU "would do better to work on supporting the economic revival" of eastern Ukraine, the ministry said. 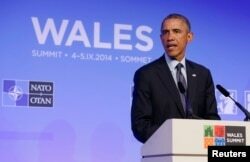 President Barack Obama holds a news conference at the conclusion of the NATO Summit at the Celtic Manor Resort in Newport, Wales Sept. 5, 2014. U.S. President Barack Obama said Friday he was hopeful, though skeptical that the cease-fire would hold. The cease-fire was approved Friday by envoys from the Kyiv government, the separatist movement, Moscow and the Organization for Security and Cooperation in Europe. The deal is part of a Russian-authored peace proposal that envisions an exchange of prisoners and safety guarantees for refugees and aid workers. Poroshenko said in a statement his decision to order a cease-fire was based on the signing of the protocol as well as Russian President Vladimir Putin's call "to the leaders of illegal armed formations of Donbass" - the pro-Russian rebels - to halt operations. Ukrainian President Petro Poroshenko speaks during a media conference during a NATO summit at the Celtic Manor Resort in Newport, Wales, Sept. 4, 2014. Poroshenko said the cease-fire protocol includes 12 steps for establishing "peace and stability" in eastern Ukraine while respecting his country's "sovereignty, territorial integrity and independence." The agreement also contains provisions decentralizing power and protecting the Russian language in Russian-speaking border regions. A spokesman for the Russian president said Putin welcomed the deal and hoped all of its provisions would be "thoroughly implemented" by the parties, leading to a "full settlement" of the crisis. The rebellion in eastern Ukraine launched in April by pro-Russian separatists has killed more than 2,600 people and created tens of thousands of refugees fleeing areas near the Russian border. Both Ukraine and NATO accuse Moscow of providing direct help to separatists. For its part, Russia has consistently denied the presence of Russian troops in Ukraine, while rebel leaders say they have been helped by Russian soldiers who have used their vacation time to battle Ukrainian troops on Ukrainian soil.